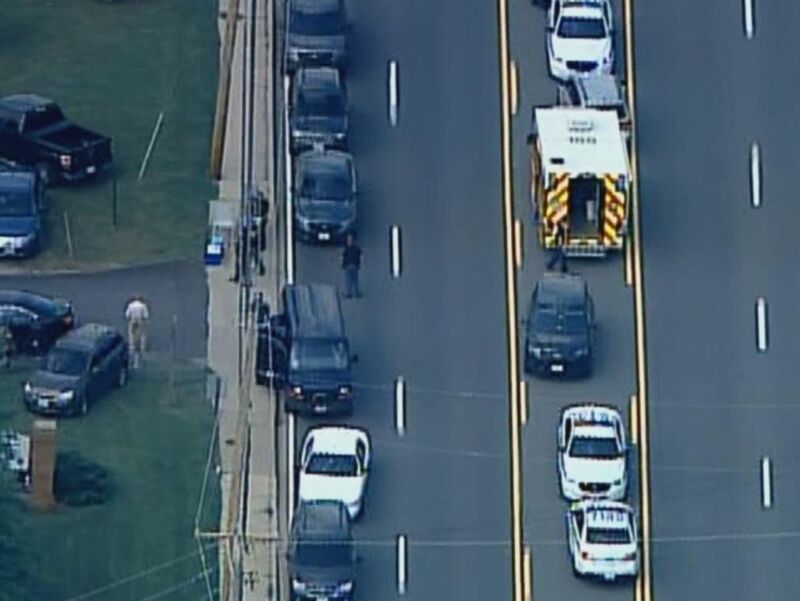 A manhunt was underway Monday evening in Baltimore County, Maryland, for four suspects involved in the killing of a police officer, who confronted them after responding to a report of a burglary, authorities said. The suspects, considered armed and dangerous, were still at large Monday evening and police were combing the Baltimore suburb of Perry Hall, where three elementary schools were under lockdown, said Baltimore County Police Chief Terrence Sheridan. The scene where a Baltimore County Police officer was shot and killed, May 21, 2018. Earlier Monday, Maryland Gov. Larry Hogan said on Twitter that the officer had been shot and killed in the line of duty. But Sheridan said detectives "won't know until the medical examiner does the autopsy and gives us a manner and cause of death." He said that just before 2 p.m., the police department's 911 center received a call from a citizen about a possible burglary involving four suspects. "Our patrol officer responded, was confronted and from that point, she was injured and we are investigating this as a homicide," Sheridan said. The officer was not immediately identified. She was rushed to Franklin Square Hospital in Baltimore, where she died at 2:50 p.m., officials said. Cpl. Shawn Vinson, a police spokesman, said the officer would have been a four-year veteran of the Baltimore County Police Department in July. "She was just doing her job," Vinson said. Corporal Shawn Vinson with the Baltimore County Police Department speaks about a County Police officer who was shot and killed, May 21, 2018. Sheridan and the officer's colleagues were at the hospital providing support to the officer's loved ones. He said investigators were reviewing the officer's activated body camera. "Every piece of evidence that we're getting access to will help us solve this case. And right at the moment, it's a little premature to be discussing what's on the body camera footage and what assistance it will be," Sheridan said during a news conference at Franklin Square Hospital. The fatal confrontation happened at the end of a cul-de-sac on Linwen Way off Belair Road in a heavily residential area of Perry Hall, police said. Vinson said police discovered damage to a rear patio door of a home in the area, indicating the officer may have interrupted a burglary in progress. "It's terrible," Sheridan said. "We're seeing something in this country today that we've never seen before. We're seeing police officers assaulted. The number of officers who have died in the line of duty is up this year. The officers who have died at the hands of gunshots is up. And so we're telling everybody to be on your toes, don't be complacent, to work with each other." He said police were combing the neighborhood where the fatal encounter occurred and that three elementary schools were on "lockdown" Monday evening and residents in the area are being asked to shelter in place. Police said Monday evening that they had recovered a Jeep believed to be connected to the incident. 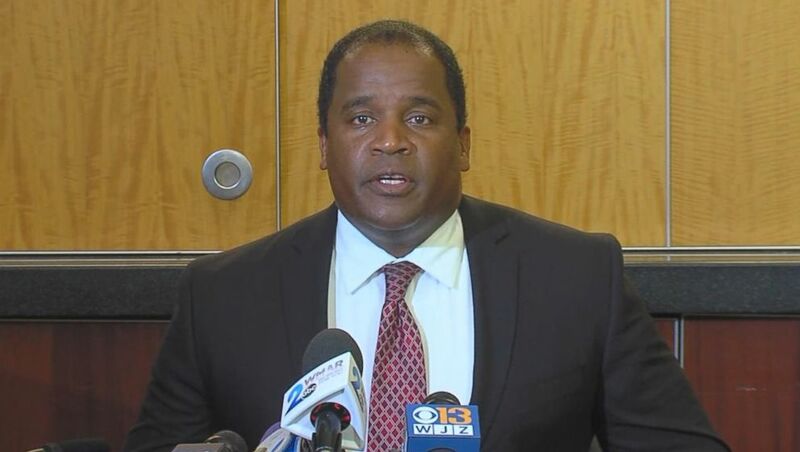 Baltimore County Council President Julian Jones expressed condolences to the officer's family on behalf of the council and the citizens of the county. "This tragedy is a solemn reminder of the sacrifice our police and public safety personnel make and are prepared to make to keep us safe each and every day," Jones said at the news conference. "We are proud of the bravery and courage and sacrifice of all the men and women who serve on our police force. No one should lose his or her life at the hands of another while trying to protect our communities. We are confident that the perpetrators of this heinous crime will be brought to justice."